In stock -This product will ship today if ordered within the next 8 hours and 49 minutes. 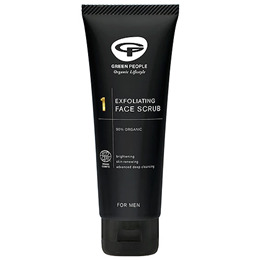 Green People Exfoliating Face Scrub is a natural and organic exfoliator and face wash containing clove, grapefruit and shea butter. Aqua, Olea europaea fruit oil*^, Helianthus annuus seed oil*, Bambusa arundinacea stem extract, Cetearyl glucoside, Cetearyl alcohol, Butyrospermum parkii butter*^, Glyceryl stearate, Bentonite, Aloe barbadensis leaf juice powder*, Lecithin*, Rosmarinus officinalis leaf extract*, Aroma [Pelargonium graveolens oil*^, Eugenia caryophyllus oil*^, Citrus grandis peel oil*, Citrus limon peel oil*, Citrus aurantium dulcis oil*], Vaccinium macrocarpon fruit powder, Sclerotium gum, Xanthan gum, Sodium citrate, Sodium stearoyl glutamate, Olea europaea leaf extract, Sodium Lauryl Glucose Carboxylate, Lauryl Glucoside, Benzyl Alcohol, Sorbic Acid, Salicylic Acid, Glycerin, Citric acid, Geraniol*, Citral*, Citronellol*, Linalool*, Limonene*, Eugenol* (from essential oils). Rub a marble sized amount on face & neck, rinse thoroughly. Use 2-3 times a week. Below are reviews of Green People No. 1 Exfoliating Face Scrub - For Men - 100ml by bodykind customers. If you have tried this product we'd love to hear what you think so please leave a review.